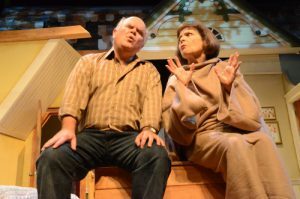 Love, lust, bee-keeping and the artificial insemination of turkeys come together in a raucous, hilarious comedy with huge, honeyed heart; The Birds and The Bees by Mark Crawford, is on stage at STC April 11 to 21. A retired empty-nester, Gail (Karen Wood) has been quietly raising bees in solitude. Unexpectedly, her grown daughter Sarah (Julia Dyan) returns home; it seems twenty years of artificially inseminating turkeys has taken a toll on Sarah’s love life and she and her husband are through. As both women set about putting their lives back in order and reacquaint themselves with living under the same roof, they are visited by an eager your grad student named Ben (Wilex Ly) who has come to study the declining bee population. Throw in a meddlesome neighbour Earl (William Vickers), a little internet dating and a pair of tickets to the last-ever Turkey Days Dance and you have a racy recipe for relentless laughter. Playwright Mark Crawford has appeared at STC as an actor, playing George Bailey in It’s a Wonderful Life and LaFleche in The Miser. His first play, Stag and Doe recently made its international premiere in Poland and his newest play, The New Canadian Curling Club, premiered at the Blyth Festival last year and recently enjoyed a successful run at Alberta Theatre Projects. Karen Wood is returning to STC after a 33-year absence. Her theatre career includes eight seasons at the Stratford Festival and ten seasons at the Shaw Festival. William Vickers has enjoyed 37 years working across Canada at most of the major regional theatres including 23 years as a member of the Shaw Festival Acting Ensemble. This is William’s fourth appearance at STC. Julia Dyan and Wilex Ly are both making their STC debuts. The Birds and The Bees is being directed by STC’s Artistic Director, John McHenry, who has recently directed Here on the Flight Path, Plaid Tidings and A Christmas Story at STC. The creative team consists of Set Designer Samantha Burson, Costume Designer Miranda DiFlorio, Lighting Designer Gavin McDonald and Sound Designer Drew Saunders. The Stage Manager is Laura Baxter with Apprentice Stage Manager Alanna Wrenshall. The Birds and The Bees is on stage for just 11 performances April 11-21. Don’t miss the laughs, book your tickets online at sudburytheatre.ca, call the STC DiBrina Box Office at 705.674.8381 or stop by in person at 170 Shaughnessy Street in Downtown Sudbury. The Birds and The Bees is generously sponsored by Media Sponsors Northern Life, Sudbury.com and Hospitality Partner Quality Inn. Sudbury Theatre Centre acknowledges the support of the Canada Council for the Arts, the Ontario Arts Council, The City of Greater Sudbury and Presenting Media Partner Eastlink. Founded in 1971, the Sudbury Theatre Centre (STC) mission is to create extraordinary theatre that engages and entertains our audience while celebrating Northern Ontario’s theatre artists and supporting the development of Northern Ontario content, and to provide outstanding theatre training and performance that educates and inspires the imaginations of our youth and emerging artists. The leading professional English-language theatre between Barrie and Thunder Bay, STC’s season runs from September through May and offers diverse Canadian and International Mainstage programming, and youth and educational programming through its Academy.